The use of camouflaged clothing by military forces is by no means a recent phenomenon. The practice of medieval huntsman wearing subdued shades of brown or green is well attested. In the modern age of gunpowder, however, it could be said that the Germans were the pioneers in the use of uniforms with colors chosen for concealment, and as early as the 17th and 18th centuries. We are pleased to bring you a vast variety of authentically correct German and Russian patterns and post-war uniforms inspired by World War II originals. We thank Mr. Daniel Peterson, Noted historian and author of 'Wehrmacht Camouflage Uniforms & Post - War Derivatives'. To help us develop and bringing us closer to the authentic line of world war camouflage. Our .45 Double MAG Pouch is a WWII reproduction single snap closure in khaki color canvas with U.S. markings. Great for WWII reenactors. This Air Force Belt is beautifully made. Silver color buckle with "Hap" Arnold design. One size, adjustable up to 52 Inches. Width 1-3/4 Inches. This Double Stack Style Dual Mag Pouch is made from the same high quality leather as the holsters and belts with 3 inch wide belt loops to fit on leather and web belts. Choose Black or Brown. This German Army Officer’s Cap WWII Reproduction is a fine German Army (Heer) reproduction visor cap that is perfect for the 2nd world war re-enactor or collector. This Army Officer’s Cap is grey green in color, complete with infantry white piping, silver cap cords, silver colored cloth cap badge and a silver colored eagle badge. Reproduction of the WWII German Army Officer's Afrika Korps M41 Tropical Field Cap issued to the Wehrmarcht. Excellent quality heavy cotton twill fabric in the correct olive green color (Luftwaffe caps are tan). Reproduction of the WWII German Army M43 Splinter Camouflage Field Cap issued to the Wehrmarcht. Excellent quality cotton Splinter Pattern fabric in the correct color. Marked in German sizes and corresponding US hat sizes. Reproduction of the WWII German Army EM Afrika Korps M41 Tropical Field Cap issued to the Wehrmarcht. Excellent quality heavy cotton twill fabric in the correct olive green color (Luftwaffe caps are tan). German Army M42 Summer Work Tunic - WWII Reproduction. This summer work jacket or blouse is made of light-weight linen and cotton material and features six button front, four pockets with scalloped flaps and split cuffs. German Army Visor Cap - Officer - Collectors Grade - Infantry. Our German Collectors Grade Army Officers Visor Caps are the top of the line WWII collector hats on the market. White wool piping for infantry. Reproduction German Army Tropical Service Shirt. Quality cotton fabric in olive color. Tropical service shirts were issued to German troops for use in Afrika, Italy and other areas of the Mediterranean. Pleated pockets, scalloped flaps, split cuffs, shoulder board loops and pebble finish buttons. Reproduction of the German Army Service Shirt. Excellent quality cotton fabric in grey color. The Heer service shirt was issued to German troops during WWII. Features pleated pockets with scalloped flaps, split cuffs, shoulder board loops with pebble finish buttons. German Jack Boots WWI Reproductions - High quality newly made replicas of the world war one German Jack Boots. Made from Full-grain suede leather uppers, leather soles with hobnails and heel irons. German M38 Fallschirmjäger Trousers WWII Reproductons are high quality German Paratrooper Pants made from the correct weight and color field gray wool. Tapered ankles for jump boots. German Luftwaffe Paratrooper Tan and Water Camo Smock - WWII Repro. This is an accurate reproduction of the Tan and Water Camouflage paratrooper smock as used by the Luftwaffe Fallschirmjäger. German M38 Army Overseas Side Cap, Field Grey Wool, for Enlisted men. These Overseas Caps are made in Germany from the highest quality wool which has been custom made to match the original field grey wool colors. German Leather Paratroopers Gloves - WWII Reproduction. These are accurate reproductions of the Luftwaffe paratroopers leather gloves. These come with elastic wrists and were worn over the jump smocks. Our German WWII Jackboots Repro M1939 are newly made replicas of world war two German Marschstiefel, Marching Boots. Full-grain leather uppers, leather soles, hobnails, heel irons, and dyed black. Great for re-enactors. This replica Leather German U–Boat Officer Jacket is custom made for us from the finest cowhide. Design based on WWII Officers coats, this rugged, handsome jacket is ready for the seas again or any adventure. The heavy grade cow hide leather simply looks better and feels better as it wears in. Reproduction of the German Heer WWII Tropical Tunic. Excellent quality cotton twill fabric and olive green color. The Tropical Tunic features pleated pockets with scalloped flaps, cotton twill, split cuffs, shoulder board loops and pebble finish buttons. Reproduction of the German Luftwaffe WWII Tropical Tunic. Excellent quality cotton twill fabric. The Tropical Tunic features pleated pockets with scalloped flaps, cotton twill, split cuffs, shoulder board loops and pebble finish buttons. Reproduction of the German Luftwaffe Tropical Shirt. Tan cotton fabric. The Tropical service shirt was issued to German troops for use in Afrika, Italy and other areas of the Mediterranean. Pleated pockets with scalloped flaps, split cuffs, shoulder board loops with pebble finish buttons. German Black Army Panzer Jacket - Wrap Repro, is a replica of the Jackets worn by Army tank crews and panzer units. These Panzer wraps are excellent quality wool fabric and color as our other German uniforms. Pink shoulder board piping. Our German WWII Tanker Pants Black Reproductions are replicas of the Black Pants worn by German panzer crews. The Tanker Pants come in the same excellent quality black wool fabric as our other German uniforms. Our German M40 Tropical Pants WW2 Reproductions are replicas of the Tropical 1940 Uniform Pants. The M40 Tropical Pants come in cotton twill fabric and are the same quality of our other German uniforms. Reproduction of the German WWII M40 Tropical Field Cap issued to the Wehrmarcht. Excellent quality cotton twill fabric and color. Comes with the correct teardrop shape, full sized tropical brim and made with the inner red material. German M44 Dot Camouflage Trousers WWII Reproduction. These replica German Pea Dot Camo Pants carry the renowned M44 dot Pattern and are great for display or reenactments. The Waffen SS Pullover Smock, 2nd Model a classic WWII smock, neck drawstring, big pockets, elastic waist, cuff bands. Oak leaf pattern camouflage, green reversible to brown fall colors, Cotton. Our German Wool Socks are new 100% gray wool reproduction Wehrmacht socks made in Germany. These wool socks are exactly like the WWII wartime socks in the correct gray color with white size rings. Reproduction German WWII M44 Dot Camouflage Field Cap issued to Waffen SS troops. Excellent quality cotton twill fabric, correct teardrop shape and camo color. This type of camouflage was also known as German M44 Pea pattern. Reproduction of the WWII German Waffen SS M43 Field Cap in Mottled Oak Camo. Quality cotton Mottled Oak Camouflage Pattern fabric in correct colors. Reversible to fall camo colors. German and US hat sizes. Our German Tropical High Boots Canvas and Leather are newly made DAK replicas. Canvas uppers with full-grain leather lowers, leather soles, hobnails, heel irons, and dyed russet. Great for re-enactors. German M43 Waffen SS Wool Field Cap for Enlisted men. These field caps are made in Germany from the highest quality wool which has been custom made to match the original field grey wool colors from WW2. German M43 Luftwaffe Wool Field Cap for Enlisted men in Blue Grey. These field caps are made in Germany from the highest quality wool which has been custom made to match the original blue-grey wool colors from WW2. German M43 Panzer - SS Wool Field Cap for Enlisted men. These field caps are made in Germany from the highest quality wool which has been custom made to match the original black wool colors from WW2. German M43 Luftwaffe Wool Field Cap for Officers. These field caps are made in Germany from the highest quality wool which has been custom made to match the original blue grey wool colors from WW2. German Mountain Troops Wool Field Cap for Enlisted men. These field caps are made in Germany from high quality wool which has been custom made to match the original field grey wool colors. German Mountain Troops Officers Bergmutze Cap. These Officers caps are made in Germany from the finest quality wool which has been custom made to match the original wool colors. M43 Generals Field Cap - Gold Piping. These Generals caps are made in Germany from the finest quality tricot wool which has been custom made to match the original field grey colors. M44 Waffen SS Wool Field Cap, single button closure cap. A favorite of German SS troops. These field caps are made in Germany from high quality wool which has been custom made to match the original field grey WW2 colors. German Tan and Water Camouflage Smock. The German WW2 Camo Smock is a reproduction of the tan and water pattern designed to be worn over the German wool service tunic. Made from lightweight material with drawstring waist and cuffs adjust with straps and buttons. German Splinter Camouflage Field Jacket - Reversible - WWII Repro. German WW2 Splinter Camo jacket is reversible to a White Winter uniform. Made from cotton shell, lining, polyester padding. Drawstring waist and hood. German M40 Luftwaffe Service Tunic Wool - WWII Reproduction. Accurate reproduction of the Luftwaffe Fliegerbluse used by pilots, field soldiers and paratroopers. High quality wool uniforms in the correct Luftwaffe Blue-Gray color. German M40 Luftwaffe Service Pants Wool - WWII Reproduction. Accurate reproduction of the Luftwaffe Pants used by pilots, field soldiers and paratroopers. High quality wool uniforms in the correct Luftwaffe Blue-Gray color. German Paratrooper Boots, 1st Model. High quality new replicas of the Leather Fallschirmjäger Jump Boots. Boots are made from black pebbled leather uppers, thick rubber soles and heels. Early models with side lacing. German M40 Luftwaffe Overseas Side Cap, Blue Grey Wool, for Officer's. These Overseas Caps are made in Germany from the highest quality wool which has been custom made to match the original Luftwaffe wool colors. German M40 Waffen SS Overseas Side Cap, Field Grey Wool, for Enlisted Men. These Overseas Caps are made in Germany from the highest quality wool which has been custom made to match the original field grey wool colors. German M40 Waffen SS Overseas Side Cap, Field Grey Wool, for Officer's. These Overseas Caps are made in Germany from the highest quality wool which has been custom made to match the original field grey wool colors. German M40 SS Panzer Overseas Side Cap, Black Wool, for Enlisted Men. These Overseas Caps are made in Germany from the highest quality wool which has been custom made to match the original black wool colors. German M43 Luftwaffe Service Pants Wool - WWII Reproduction. Accurate reproduction of the Luftwaffe Pants used by pilots, field soldiers and paratroopers. High quality wool uniforms in the correct Luftwaffe Blue-Gray color. Reproduction of the German service WWII M36 Tunic issued to the Wehrmarcht and Waffen SS from 1936 through the end of the war (also called M41). Reproduction of the German service WWII M40 Tunic issued to the Wehrmarcht and Waffen SS from 1936 through the end of the war. Our German WWII M40 Field Grey Wool Trousers are Reproduction Pants of the German uniform WWII M40 Pants issued to Army, Waffen SS and Luftwaffe ground units. Made from quality wool and features straight ankles. Our German WWII M43 Field Grey Wool Trousers are Reproduction Pants of the German uniform WWII M43 Pants issued to Army, Waffen SS and Luftwaffe ground units. First issued in late 1942 or early 1943. The reproduction German WWII M43 Field Cap is a wool cap with twill lining. First used by mountain troops. The reproduction German WWII M43 Black Tankers or Panzer Field Cap is a wool cap with lining. Used by armored troops and can be worn by all ranks. Features fold-down ear flaps with cloth loops and pebble finished buttons. Our U.S. GI M43 Field Jacket WWII Reproduction is an accurate replica of the later version 43 field jacket. This jacket includes 4 front pockets, collar tab and buttons, shoulder epaulets, 6 front buttons, drawstring waist and clothes at wrist. The German WW2 Army Splinter Smock is a reproduction of the German Heer Splinterpattern Tarnhemd designed to be worn over the German wool service tunic. Made from splinter camouflage material with drawstring waist. Reproduction of the WWII model German M40 Wool Overcoat. Two rows of buttonholes and the wool fabric and twill lining are excellent quality; the coat has roll back cuffs with hook and eye fastener at the collar. Reproduction of the German service WWII M43 Tunic issued to Heer and Waffen SS soldiers through the end of the war. Non-pleated pockets, 3 eyelet belt hook provisions. Wool fabric, color and twill lining are excellent quality. Our German WWII Assault Gun Jacket Reproduction is a replica of the Jackets worn by German assault gun crews and many panzer units. The Assault Gun Jacket comes in the same quality wool fabric and color as our other German uniforms. Our German WWII Assault Gun Trousers are Replicas of the Pants worn by self propelled assault gun crews and many panzer units. These Assault Gun Trousers come in the same excellent quality wool fabric and color as our other German uniforms. 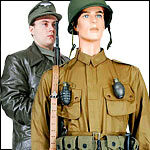 Reproduction German WWII M40 Tropical Tunic - The Tropical M40 features pleated pockets with scalloped flaps, cotton twill fabric, split cuffs, shoulder board loops, no hook and eye at the collar, and reproduction buttons. This authentic reproduction German Army WWII Tan & Water Reversible Winter Parka Reverses to a Winter White uniform. These are cut to fit over the German field Tunics. U.S. Combat Boots WWII Reproduction boots worn by our troops in WWII. Full-grain suede Leather Uppers, Rubber soles, Repairable, Ankle wrap around. U.S. HBT Fatigue Cap completes the WWII U.S. GI Herringbone Twill two piece Fatigue Uniform. From 100% cotton twill, OD 7. U.S. HBT Fatigue Jacket completes the WWII U.S. GI Herringbone Twill two piece Fatigue Uniform. From 100% cotton twill. U.S. HBT Fatigue Pants completes the WWII U.S. GI Herringbone Twill two piece Fatigue Uniform. From 100% cotton twill. Our German WWII Luftwaffe Officer’s Cap Reproduction is a fine reproduction visor cap and perfect for the re-enactor or collector. This Luftwaffe Officer’s Cap is blue and black in color, complete with silver piping, silver cap cords and a silver colored Luftwaffe eagle badge. Patent leather visor and leather sweat band. The German Reproduction WWII M40 SS Overseas Cap is a Field Gray Wool Overseas cap worn by all troops of the Waffen SS throughout the War. Authentic reproduction WWII Airborne Paratrooper leather chin cup. This is the protective leather chin cup for attachment to helmet (A) yoke straps, worn by US Paratroopers in world war two. These Chin Cups include the lining. Reproduction of the EM German Afrika Korps WWII M41 Tropical Field Cap issued to the Luftwaffe. Excellent quality heavy cotton twill fabric in the correct tan (army caps are olive green). Reproduction of the Officer's German Afrika Korps WWII M41 Tropical Field Cap issued to the Luftwaffe. Excellent quality heavy cotton twill fabric in the correct tan color (army caps are olive green). U.S. D-Day Cricket Brass Reproduction used exclusively by the 101st Airborne Division on D-Day June 6th 1944. The Cricket used pressure on a metal spring blade to make a (Click - Clack) sound for identification. U.S. M1 Ammunition Carrying Bag. General purpose ammo bag from OD canvas was used for carrying boxed ammo for machine guns, rifle clips, carbine magazines and mostly hand and rifle grenades during WWII. Beautifully crafted reproduction German WWII era greatcoat. Coveted by officers of all service branches and always in short supply. 100% premium full-grain leather in long overcoat style. Double-breasted button front. 2 front pockets. Kids B-15 Nylon Bomber Jacket! Children's B-15 Bomber Jackets made to look like the real ones with plenty of U.S. patches sewn on. Bomber Jacket has nylon shell and insulated. Faux fur collar, knit cuffs, elastic waistband. These Pirate Captain Cups are made of spun brass and plated inside with silver, these two jiggers are safe for your next toast! Brazed onto each cup is a copper skull and crossbones, for added pirate flare. Includes a beautiful hardwood storage box with brass accents and top plate suitable for engraving. Reproduction of the German WWI M15 Tunic or Feldbluse. Our German WWI 1907-10-14 Stone Grey Wool Trousers are detailed reproduction from the first world war. These pants are made from quality stone gray wool and piped in red for infantry. Our u.s. Collectors Grade World War II Army / Army Air Corps Visor Caps are the top of the line WWII collector hats on the market. Made from premium materials, these United States Army caps feature Olive Drab wool twill tops with wool mohair cap bands. Kid's B.D.U. Shirts feature a Cotton / Polyester blend, four button down pockets and a three button-up front. Kids Digital Camo BDU Pants are perfect for the mini solider! The military style pants feature adjustable waist tabs, drawstrings and zipper fly.